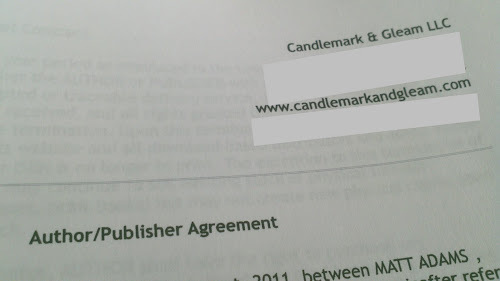 I've signed a contract with Candlemark & Gleam for my book I, Crimsonstreak. This is a small press, a relatively new one, but they've already released some tremendous books (check out Erekos and Broken). When I say tremendous, I mean tremendous, and Publishers Weekly agrees. The purpose of this post is to illustrate how this book deal happened, how fate intervened at just the right moment, and how a rookie writer with a few short stories under his belt hit the right note with an up-and-coming publisher. This novel is actually my second attempt at writing a book. My first, a lovely project called Seven, began in 2005. I finished it in a flurry over several days while trying to make the deadline for the Amazon Breakthrough Novel Award. That was in 2007, the inaugural year for the contest. That book had no shot. Seriously. It still exists--I've done some revisions--but Seven is in serious need of polish. Actually, probably a complete rewrite is in order. I'll get to that...someday. I, Crimsonstreak started simply with the title Hero. It was my attempt to write a superhero book. The original file is still hanging around on my hard drive and clocks in at a meaty 55,000 words. I started it in October 2007, shortly after submissions opened for the Amazon contest. The first draft came fairly quickly. The book uses a first-person narrative and the voice embodies my own with a heckuva lot more snark. Because the character, initially, mirrored me in many ways, the writing flowed very easily for that first draft. They were comfortable shoes, to say the least. In 2008, the book's title became I, Crimsonstreak. I experimented with making my own cover (all attempts were poor efforts) and then had an idea to add "meta-fiction" to the book. These were newspaper articles, character profiles, journal entries, and other fictionalized writings meant to give the world a more "lived in" feel. More revisions followed and I decided it was time to query. I began that long and frustrating process in 2009, when I didn't know anything about publishing (as opposed to today, when I kind of think I know something about publishing). You'll probably be shocked to know those queries weren't well-received. The pitches were bad (I looked up some old emails and cringed) because I spent five minutes writing them. I described the length in terms of Microsoft Word pages instead of actual word count (all together now: forehead slap!). I moved on to another project. The sentiment in publishing is that if you can't sell your book, you write another and keep writing until you sell something. Some authors get frustrated, give up, and never reach this point. I was too young and idealistic to give up, so I churned out a couple other projects, while Crimsonstreak sat on the ol' hard drive, untouched, unloved, and full of untapped potential. The market wasn't ready for a superhero book, I told myself. Unless you had a licensed Marvel/DC character, most superhero novels were doomed to fail. Even the licensed tie-in books, it seemed, weren't all that well received. I wrote another superhero book titled The Franchise, which I felt was my best effort. I polished and polished and polished that one before attending my very first writing conference, the Midwest Writers Workshop in summer 2010. I pitched my book to an agent, and even though he didn't represent the genre, he had a few kind things to say and suggested I keep plugging away. I ended up informally pitching that book to another agent, who requested the full manuscript. She eventually passed, but I was gaining confidence. Ebooks, once thought to be a fringe dalliance for readers daring enough to buy a Kindle, exploded. Like, Death Star-at-Yavin exploded. Self-publishing, it seemed, was the way to go. With stories of J.A. Konrath, Amanda Hocking, and John Locke dominating writing and publishing circles, I thought it was time to dive in. I bought a Kindle, learned about ebook formatting, Smashwords, and Amazon's Kindle platform. My thought was to take I, Crimsonstreak, give it to my beta readers, design a cover (my attempts were much better as my photo-editing skills improved), and then self-pub it. Just to see the process, just to go through it. If I was going to be a writer, I needed to know where writing was going and it was obvious ebooks were driving sales. Jane Friedman, an advocate of digital publishing and frequent guest at the Midwest Writers Workshop, saw it coming, even though a lot of people were skeptical. The book went through an intensive, two-month rewrite/revision. By the time I was finished, what was once a 55,000-word book now had 96,000 words. It felt better, more rounded, more professional. I became excited about the book again, but I knew it was going to be a tough sell for agents/editors. I, a debut writer with a few obscure short stories to my name, wanted to pitch a superhero novel. I had made the decision, with no resources, no connections, and no guidance, to self-publish. I was late to Twitter. If you're a writer, get on it. Now. Don't stop, don't think about it. Bookmark this post or open a new browser tab and register NOW. In May, I started following David Rozansky, the editor of Flying Pen Press and a very engaging Twitter user with more than 6,000 followers. Within a week of following his tweets, I found out about #bookmarket, a weekly Twitter chat about books, publishing, writing, and marketing. Sometimes reticent about engaging people I don't know, I dove in and asked a simple question during the chat on May 12: what genre does a superhero novel fall in? The answers were all over the board. I didn't expect that, although I should have. Fantasy, sci-fi, paranormal, war, crime fic, detective stories, noir...the "superhero" genre is multifaceted. One tweet came from Candlemark & Gleam: "In the case of BROKEN, superhero fic overlaps sci-fi and dystopia. Hit with readers. Love it." I'd never heard of Candlemark & Gleam. I'd never heard of Broken. C&G is a small publisher operating out of Vermont specializing in spec fic/sci-fi. The book Broken by Susan Jane Bigelow is a novel with superhero elements. Just like that, I went from "I'll just self-publish this unpublishable book" to "let's give them a try." There are authors who will say this was the wrong move; that I should self-publish. Maybe they're right. But I'm just a guy with Twitter and a blog. I put some short stories up on the Kindle/Smashwords platform, and they didn't do particularly well (caveat: I didn't exactly promote them, either). I wasn't confident that putting Crimsonstreak in the market and trying to do it ALL by myself was the way to go. I wanted a partner; I wanted someone to help guide me through this process. I gambled on Candlemark & Gleam in hopes they would gamble on my novel. But I wasn't ready quite yet. All this was happening as I was trying to sharpen the book. With help from one of my beta readers, I was already elbow-deep in crafting a better I, Crimsonstreak. I killed off a character when we realized this was a fitting part of a character arc. I worked to tone the voice of the main character and bring consistency to some of his actions. I even added some of the extra content in the back of the book. Before I submitted to Candlemark & Gleam, I wanted everything to be pitch-perfect. C&G hit all the check boxes. Publishing is a game of Battleship. You call out "F3" and hope for a hit. Most of the time, you're rewarded with a white peg. Even though the publisher fit my material perfectly, the chance of scoring a "hit" seemed very low. Still, I was hoping for a red peg. 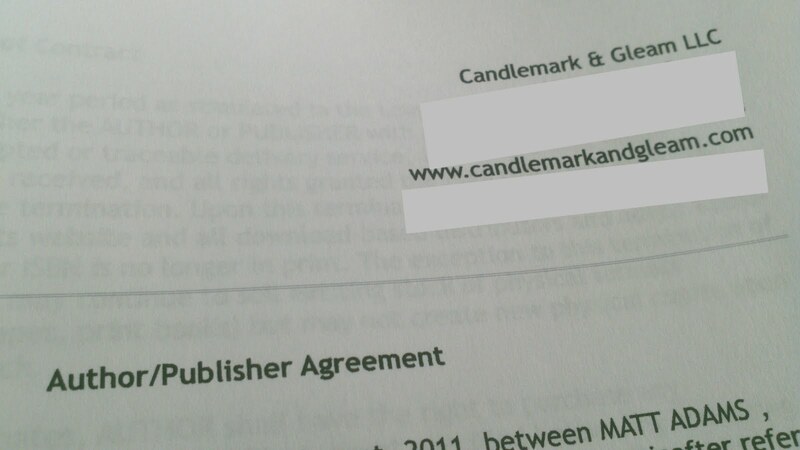 A week after the Twitter chat, after looking up information about Candlemark & Gleam, I took the plunge. This all came after an intensive revision of the whole book and another round of re-polishing the first 50 pages. On May 18, I unleashed I, Crimsonstreak on the publisher with a rather enthusiastic and (embarrassingly) long cover letter recounting our brief Twitter conversation and the required table of contents, synopsis, and 50-page sample. A week later, on May 25, I received a request for the full manuscript. Finished, right? End of story! Email and Twitter move quickly. It's not a failing of human beings, but it is a reality. Editors are juggling several projects and several authors. They have other submissions to read and evaluate. Your submission is just another in their Infinite Pile of Novel Ideas. It takes time to read a book. I'm a fast reader, but it still can take a while with a job, family commitments, writing time, blogging, etc. So I knew it'd be a little bit before the editor responded with a decision on my book. I kept writing short stories, tweeting, and blogging, but my thoughts were focused on the excruciating wait. Do they like it? Do they hate it? Were the first 50 pages full of promise, only for the last 350 to be a letdown? Is the story told skillfully enough? I have two email accounts; one for personal use and one for my authorial pursuits. These are, of course, connected to my smartphone, which beeps/vibrates every time I get a new message. Every Amazon.com offer, every email (be it from AMC Theatres, O'Charley's, Logan's Roadhouse, Facebook, Twitter, Barnes & Noble, my parents, or someone else) was an exercise in "is this THE email?" Nearly two months passed before I had an answer. On July 19, at 9:49 p.m., editor Kate Sullivan emailed her response. I, Crimsonstreak, it turned out, was a "go." Candlemark & Gleam wanted it, but the editor had a couple of changes she wanted me to make before issuing a contract. The edits seemed reasonable enough and I had two options: do them "on spec" or with a conditional contract. Since I was already terrified with the prospect of having a contract at all, I agreed to do the revisions on spec (this means there's no contract, just the understanding that if I made the edits and they met the publisher's approval, a contract would follow). These were in no way major changes. One of the requested changes involved the supplementary material, which my beta readers and I kind of "glossed over" during our extensive revisions of the main narrative. Another was a character who didn't quite "click" in its current form. I told the editor my re-edits would be quick and painless...and I was telling the truth. I wasn't being asked to rewrite the whole novel or completely change the plot; I was being asked to tweak a character and the supplemental meta-fiction. The editor even offered a suggestion for the minor character in question. I could do this, competently, within a week or two. On July 29, I sent my revisions. Two days later, the editor responded that she was swamped and warned it could be a little while before she would be able to reread the manuscript (apparently, it was some crap about how they had "other authors" to work with /sarcasm). Teeth-gnashing, excitement, and anticipation followed. About a month later, on August 28, I had my final, final, final answer. My book I, Crimsonstreak is due out May 2012 from Candlemark & Gleam! I can't tell you how excited I am! You can bet I'll keep you updated on everything as the book takes shape. Congratulations, Matt!!! I'm very excited for you and very proud of you!!! This is VERY AWESOME news and i can't wait to buy my copy next year!!! I'll find a way to get your copy signed! That is wonderful! I have an idea for a superhero book as well, but I want to tackle some other projects before I do it, because I want it to be the best work possible. It's nice to know that patience pays off! Keep writing, keep working hard at it, and GREAT things will happen! Matt I stumbled across your blog today in doing some Google research on small press publishing houses. I decided earlier this year to try my hand at self publishing and recently was told I may have a chance to have my work published by a small house! I won't know until the end of the month and if it happens I will be writing a post similar to this on my own blog. Congrats on your deal and for realizing your dream! The process you described is very inspirational! Feel free to stop by my blog if you'd like. All the best to you! I'm glad you stumbled into my neck of the woods! There are many advocates of self-publishing, but as a newcomer, I felt I needed a little help. It's worked out very well to go with a small press. The exposure it going to be limited compared to a "Big Six" publisher, but I think it was the right decision for me. Thanks so much for your reply! I learned a lot from reading your post and I too feel the same way. I'm delighted to know that I have a shot at traditional publishing now if I'm selected by this small press house. Self-publishing is a huge undertaking and it's something that I had resolved myself to and will still do if I have to, but the help a publisher can provide is definitely welcome! I will keep you posted on what happens! I send you best wishes on your book launch and I'm off to enter the haiku contest! Cheers!